We honor Jesus and the Virgin Mary to cultivate a divine love for humanity. According to the Bible and Christian tradition, Mary challenged all scientific logic by immaculately conceiving Jesus Christ (Emmanuel), the Savior. Her holy son would change the course of history. Before his birth, the Archangel Gabriel came to Mary with a prophecy of her son the Savior. Mary was chosen because she had proven herself worthy of the honor and suffering that would come. Jesus and the Virgin Mary have varying stories and deific associations for different faiths and peoples – for instance, Muslims and Buddhists believe that Jesus existed, but as a prophet or ascended master, and not as a child of God. Of course, the Bible didn’t exist yet during the time of the Old Testament, so its stories were written later by disciples and scholars – divinely inspired interpretations of history pieced together into one sacred book. Belief in these stories and in Christ the Savior is universal across Christian-based faiths. With this offering, you can choose to purchase the Jesus and the Mary set together, or you can choose to purchase each tool individually. Order your tools as you feel called, but keep in mind that these two are an energetic pairing and their energy is meant to be worked with in unison. My Jesus set starts with my Jesus perfume. This is a divine blend that embodies strength and sanctuary, while calling in healing and protection. With notes of cypress, frankincense, myrrh, and cinnamon bark, and bottled with a bloodstone chip stone, this perfume brings the Savior in tangible form. Next you will receive a beautiful Jesus candle. Hand rolled right here at our SG headquarters, this candle comes in layers of crimson and mustard. 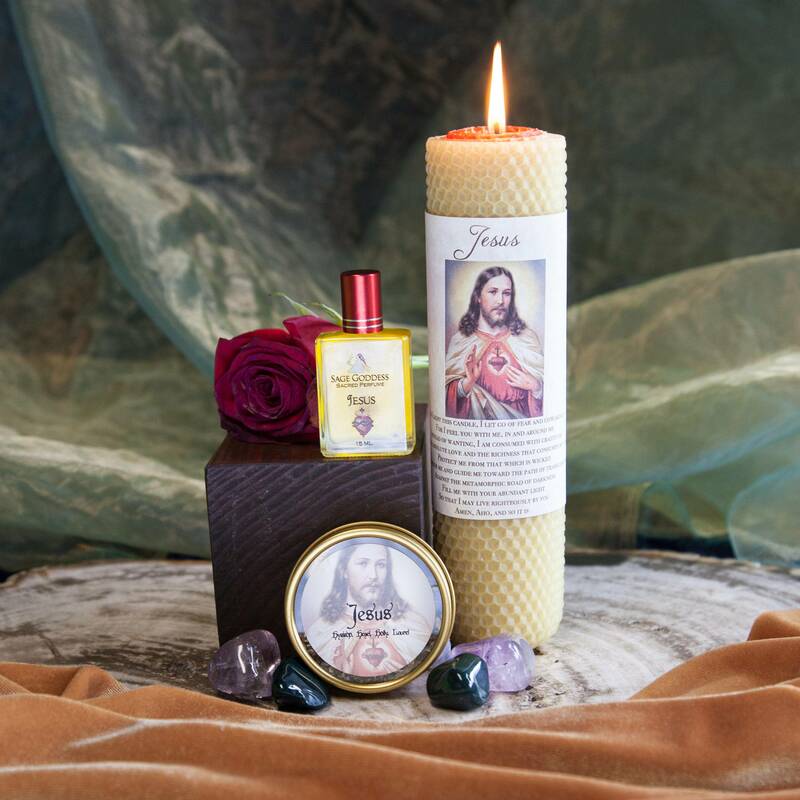 Each candle includes custom SG artwork and a blessing to invoke Jesus’ unconditional love. Jesus’ stones are bloodstone and amethyst. 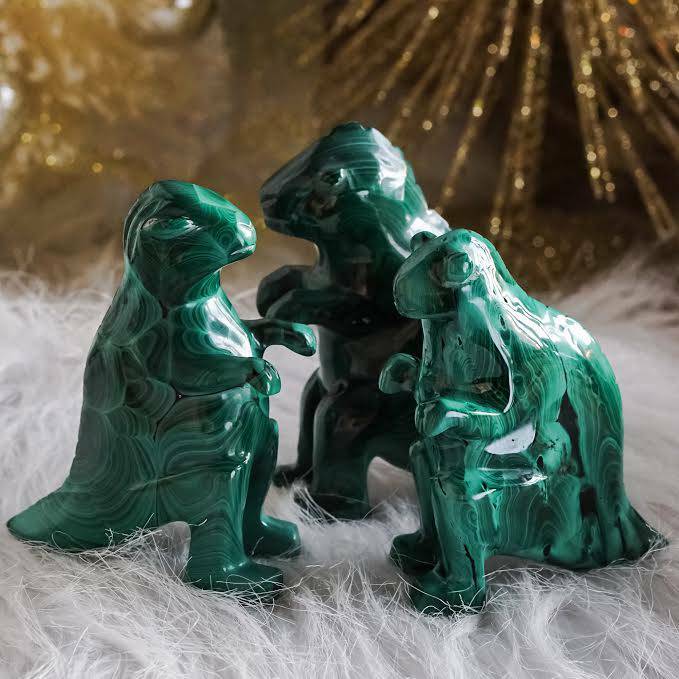 According to Christian legend, when Jesus Christ was crucified, the dripping blood stained the green jasper at his feet, and this was the origin of bloodstone. 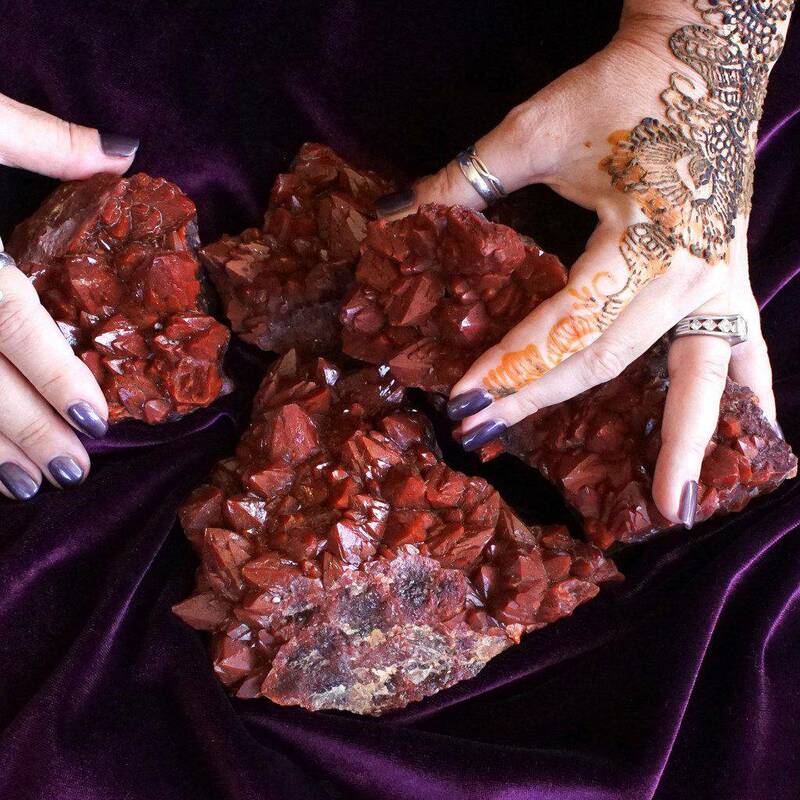 Bloodstone was widely used in sculptures representing flagellation and martyrdom, and was known at one time as ‘the martyr’s stone’. 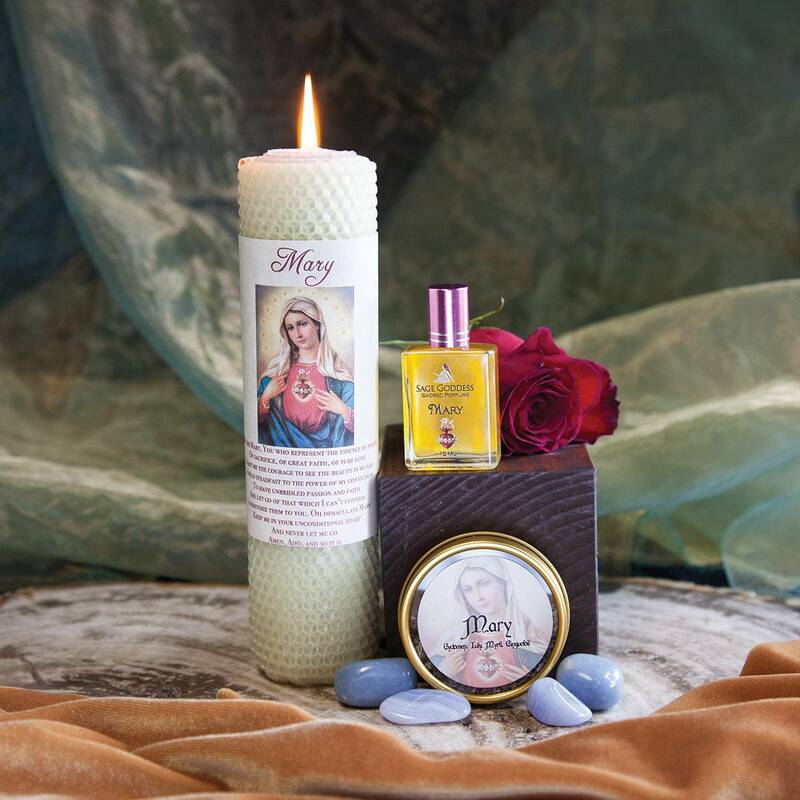 My Mary set starts with my Mary perfume, which will anoint you with ancient and powerful notes of Angelica, Rose, and Cedarwood. Each bottle is infused with a rose quartz to further amplify its heart healing properties. Next you will receive a beautiful Mary candle. Hand rolled right here at our SG headquarters, this candle comes in layers of eggshell and azure blue. 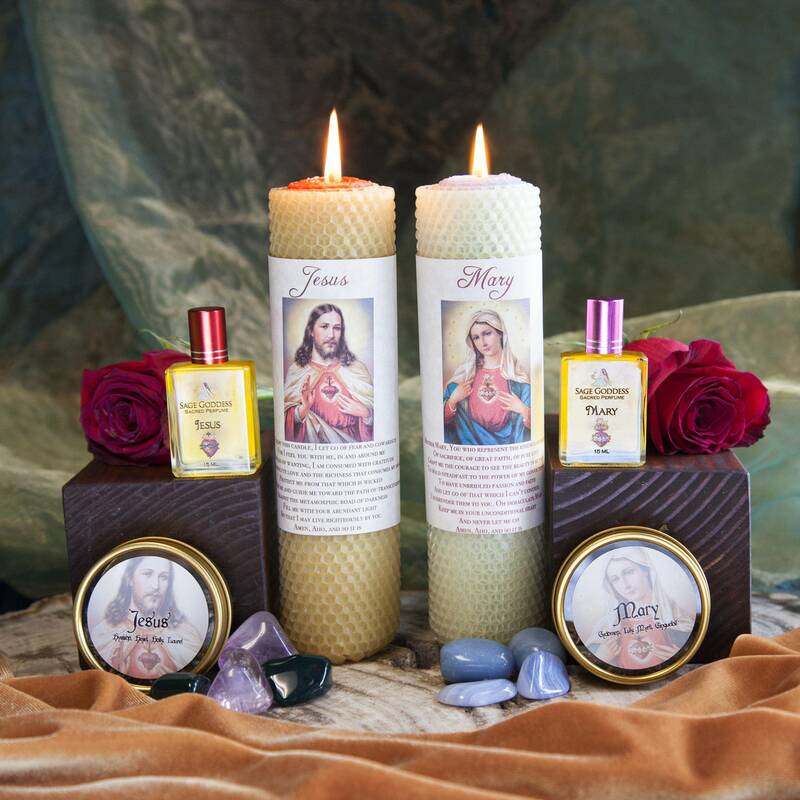 Each candle includes custom SG artwork and a blessing to invoke her immaculate faith. You will also receive a tin containing herbs chosen to align with Mary’s energy: Lavender, Myrtle, and Cinquefoil. This sacred combination brings matter into form, carries the magic of happiness, and brings forth wisdom, love, and power. If you want to know more about why these herbs were chosen, join my Magical Sabbatical online class! We dedicate an hour each month to the herbs, stones, and oils of the deities for that month and together, deepen our knowledge about gemstones and herbal medicine. Mary’s stones are angelite and blue lace agate. Angelite acts as the deep exhale, and activates the Third Eye and Throat Chakras, enabling you to receive and give calm communication, compassion, and intuitive thought. Used as a meditation guide and for dream work, it can help with awareness and tapping into higher dimensions. Angelite is useful in connecting with angelic guides, as the name implies. 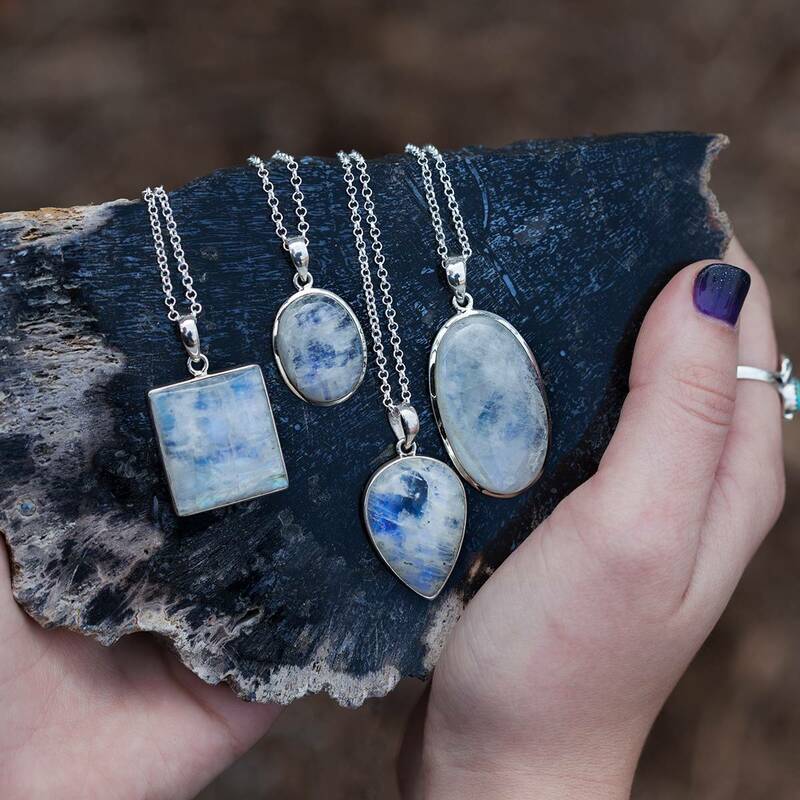 Blue lace agate is a stone of calming and centering. It assists you in choosing wise words with a clear mind and conviction. It also relaxes the mind and helps to alleviate restlessness, while banishing fears and worries to allow for restful sleep. This listing is for one (1)Set honoring Jesus and Mary, either individual set, or the tools of your choice. Choose from the drop down menu as you feel called. Your tools will arrive lovingly gift-wrapped for your pleasure and delight.